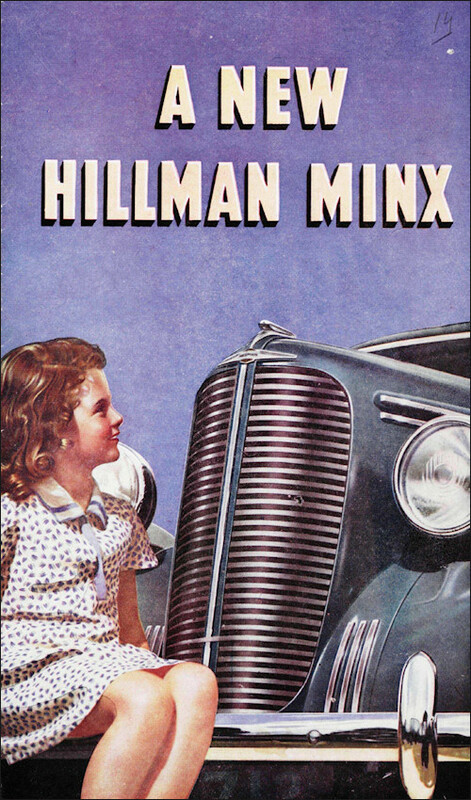 Hillman Minx was reintroduced in 1945. Have, it is claimed, no fewer than 57 improvements compared with the 1940 model, to which it look identical. 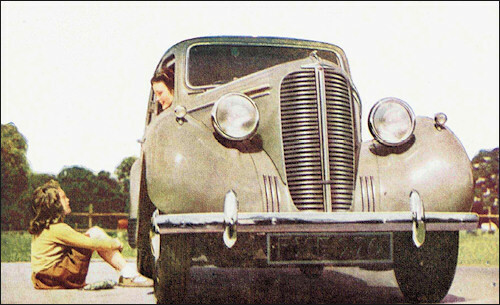 The price (in October 1946) is £442 and a Drophead Coupé is available at £525, both prices inclusive of PT. Special scientific chassis design is of immense strength. 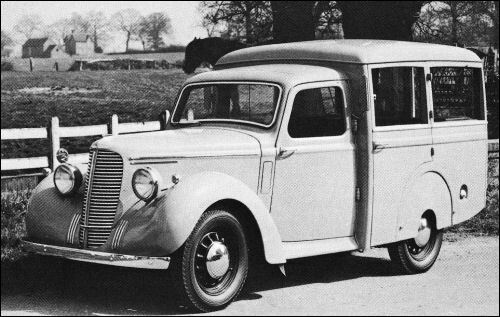 This exclusive Hillman feature ensures an increased margin of safety, and noiseless, draughtproof coachwork — a great scientific advance on any other method. Increased performance and economy is due to considerable weight reduction and many engine refinements. 12-volt sealed-vent battery and constant voltage control give instant starting, extra powerful headlights and increased reliability. New outsize luggage boot gives more than double the enclosed luggage space of earlier Minx models. Lid rises easily to fully open position after catch has been raised — spring-poise prevents lid falling. Compartment is illuminated automatically at night. 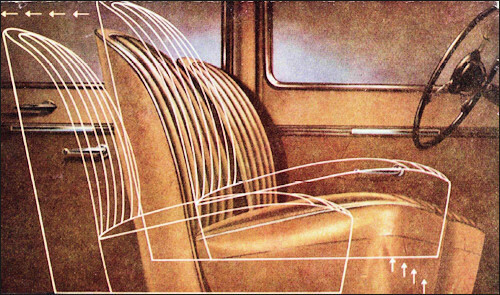 Stylish new coachwork design shows great advance over all other 10 h.p. cars. Beautiful modern radiator with 'flared' bonnet and streamline luggage locker give ultra-smart appearance. Beautifull new interlor gives increased roominess, additional headroom in front, greater legroom and width in rear compartment. New and luxurious interior appointments include higher quality upholstery, stylish new trim designs to doors and seats, extra wide rear shelf, three ashtrays and silk rope pulls. 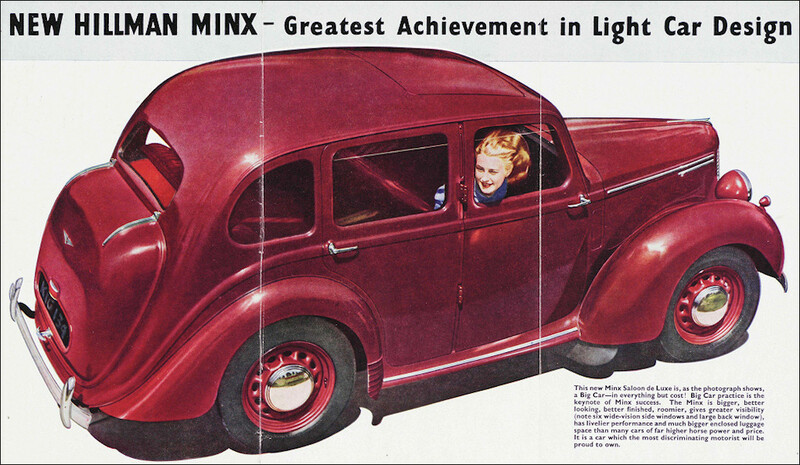 Famous Minx power unit has many improvements and refinements, including redesigned cylinder head, new non-distortion cylinder block, new exhaust manifold, special design 'hot spot' for carburation, giving more power, easier starting and increased economy. Greater smoothness and silence at all speeds. New "balanced ride" suspension includes extra long front springs, automatic adjustment to loads at both front and rear suspension, and rubber bushes to shackles, eliminating ten greasingg points. Simplified new bonnet-opening gives immediate and unique accessibility to both sides of engine at same time. Design ensures immense gain in strength, safety and bonnet silence. New draughtless ventilation system by window louvres, giving improved visibility. Six wide-vision windows, wide opening 'easi-control' windscreen, two scuttle ventilators. Body completely insulated against draughts, fumes and noise. Remarkablee new luxury seat for driver is instantly adjustable for height, slope and legroom. Yale ignition key locks all doors and luggage boot. Switching off ignition makes wind-screen wipers and trafficators inoperative. New handbrake located between front seats gives increased roominess in front compartment, easier and safer operation and control — acts on all four wheels. Stylish spring-spoke steering wheel fitted on Saloon de Luxe. Improved rake of steering columnn gives easy, positive control. Steering box positioned above frame, increasing front ground clearance and eliminating risk of damage. Drip mouldings are fitted to all models. A vast war-time experience and research is reflected in the post-war model which now includes the following new features—additional to the many advantages always provided by Minx and detailed overleaf. INCREASED SAFETY: Stifferr chassis frame and anti-sway bar for safer fast cornering and general "roadability"—improved steering gear and control—steering wheel free from road shock. GREATER POWER AND ECONOMY: This world-proved Engine with new type cylinder head, increased compression ratio and Lo-ex alloy Pistons now givess 35 b.h.p. with far more economical fuel and oil consumption. IMPROVED PERFORMANCE: With such increased power—a higher rear axle ratio— swifter and pleasanter cruising speeds with less engine effort, new type air and exhaust silencers greatly reducing noise. SMOOTHER RUNNING EVEN FOR MINX: Improved engine mounting, providing greater stability for power units. Gearbox refinements for quieter running. BALANCED CLUTCH CONTROL: Preventss clutch judder, allowing engine to float on its mounting, isolating clutch pedal from engine movement. RUST-PREVENTION: Underframe assembly and body parts are specially treated to prevent corrosion and its damaging effects. IMPROVED BODY SILENCE & COMFORT: Effective sound-insulation, draught and dustproof. Improved shock absorbers, new design window channels, easier and quieter closing of doors. MINOR POINTS OF MAJOR BENEFIT: Easier "get-at-ability" of crankcase oil filler and dipstick. Improved fixing and easy removal of spare wheel. Modifications to increase life of exhaust valves and seats with leaded fuels.. Improved waterproofing for brake linings. New brake drum, providing smoother and more effective braking, with less wear. Better chromium plating for rough usage. New type jacking system, simple and immediate engagement of starting handle. 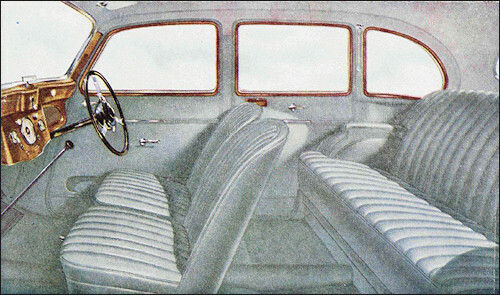 The specification of the Saloon de Luxe includes the following equipment.— Window Louvres, Spring-Spoke Steering Wheel, Three Ash Trays, Silk Rope Pulls, Multi-plane Driver's Seat, Adjustable Front Passenger Seat, Leather Upholstery, Dual Screen-wipers, Sun Visor, Special Door and Front Seat Trim, Chromium Plated Radiator Grille, Side Armrests, Pockets to Doors, Over-riders to Bumpers. Our Engineers have made provision for the simple fitting of a wireless receiver. IN VIEW OF POSSIBLE POST WAR RESTRICTIONS, ITEMS OF SPECIFICATION HEREIN MAY BE MODIFIED WITHOUT NOTICE. New luxury driving seat, is instantly adjustable for height, slope and leg-room, and provides twenty different driving positions to suit any size driver. Steering column has also improved rake for easy and positive control. Increased roominess is given in the beautiful new interior; there is additional head-room at front and considerably greater leg-room—as well as width—in the rear compartment, in which the flooring is so designed as to provide a natural footrest. The ample window space gives splendid visibility for everyone. New system of draughtless ventilation by window louvres on both doors, six wide-vision windows, wide opening "easi-control" windscreen, two scuttle ventilators. Body is completely insulated against draughts, fumes and noise. The new Minx Drophead Coupé. 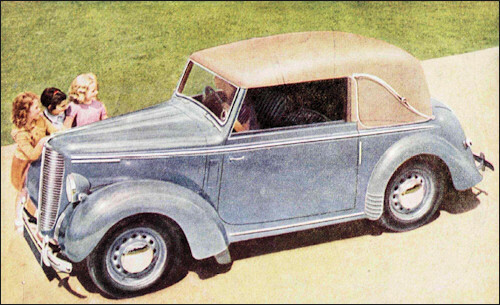 The simple hood-folding design virtually gives three cars in one—a completely closed Saloon, a Coupé de Ville and an open Tourer. These transformations can be made quickly from inside the car. 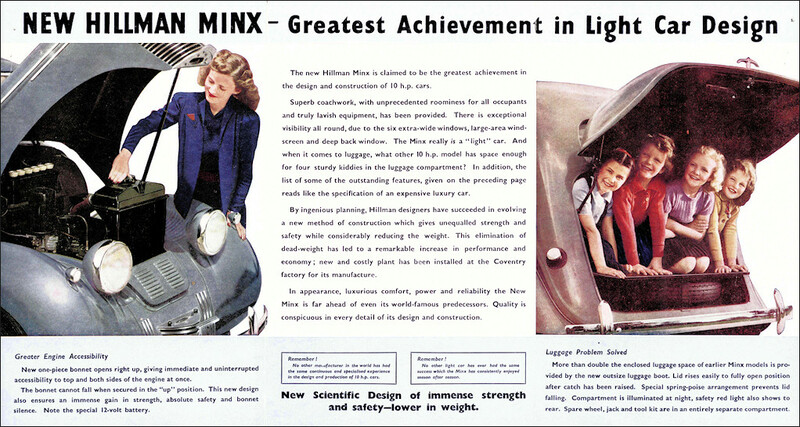 Minx Estate Car, a derivation of the van. 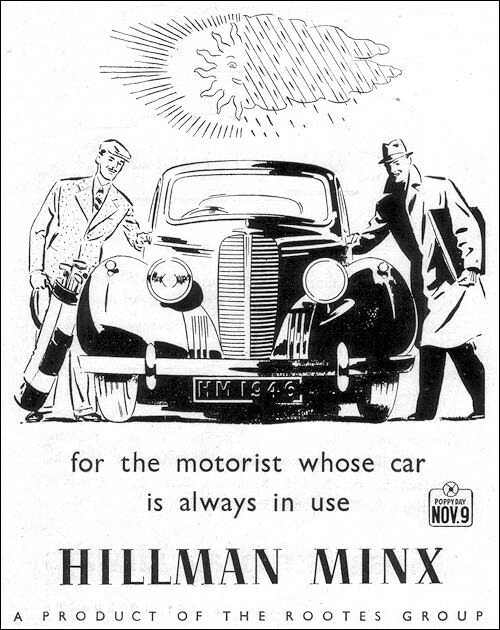 Hillman Minx-based vans carry the Commer nameplate, Commer being the principal line of Rootes' commercial vehicles.